The Anomaly is an old school adventure story, if your school is action movies of the 1980s and 1990s. A cross between Indiana Jones, the works of Dan Brown and the X-Files, The Anomaly follows a group of documentary makers in search of the unknown who, never thinking they will actually find it, stumble on an ancient mystery. What follows is a thriller that ticks all of the haunted house boxes. Nolan Moore is a washed up screenwriter who is scraping by making a web-based TV series called The Anomaly Files. In the show he pursues hidden secrets, myths and conspiracies. He never actually finds any but he tells a good story. In this case he is planning to tell the story of a mysterious cave found in the depths of the Grand Canyon by some explorers in the 19th Century. Bankrolled by a new sponsor, Nolan sets off with his crew and a journalist, to see if he can locate the cave. But when he actually manages to find it and is trapped inside with his crew, an ancient mechanism is triggered and all hell breaks loose. 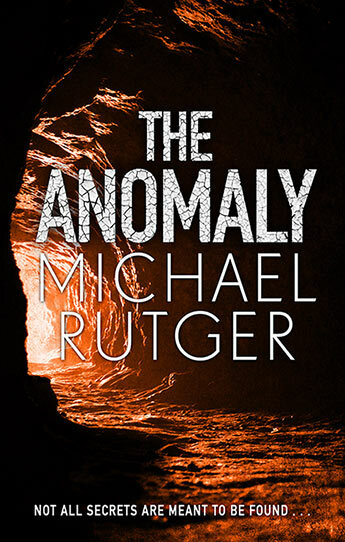 Michael Rutger (pen name of British novelist Michael Marshall Smith) is, according to his bio, a screenwriter and if anything, The Anomaly feels like a screenplay. There are plenty of jump scares and close scrapes, flickering light sources, noises in the dark, some body horror and betrayal. And the characters are straight out of central casting – the idealistic explorer pining for his ex, the grizzled veteran, the good looking cameraman, the cynical journalist and the motherhen producer who is scared of the dark. But none of it really makes any sense when looked at too closely. The trick, as in most action movies, is to hope the rollercoaster ride experience carries readers over the clichés, lack of explanation for pretty much everything that goes on and the sizeable bumps in the narrative. Making The Anomaly a fun ride but not a memorable one. A version of this review first appeared in Aurealis #116, Australian Science Fiction and Fantasy Magazine, www.aurealis.com.au.